This article is about the band. For the graphical image, see Stick figure. Stick Figure was founded in 2006 as a one-man band by multi-instrumentalist, songwriter, and producer Scott Woodruff. Woodruff, originally from Duxbury, Massachusetts, began playing instruments at the age of 17, and was primarily drawn to reggae. His style of layering tracks to create songs was particularly inspired by Keller Williams who utilized a looping method to create music. Woodruff began writing and producing music in 2006, which incorporated roots reggae with dub, a subgenre of reggae. As a freshman in college, Woodruff began submitting instrumental tracks to the Sublime Archive website and consequently adopted the moniker Stick Figure, which was a take on his high school nickname. On December 11, 2007, Woodruff released his first album The Sound of My Addiction under Ruffwood Records. Founded by Scott Woodruff, Ruffwood Records released all of Woodruff’s albums to date. The Sound of My Addiction established Stick Figure’s style of self-production. Woodruff created this album by "recording instruments individually, [and] layering tracks on top of one another in unison", a style he used to create subsequent albums. On January 16, 2008 Woodruff released his sophomore album, Burnin’ Ocean under Ruffwood Records. This album was one of the Top 10 Best Reggae Albums in 2008 on the Apple iTunes charts; notable tracks include “Burnin’ Ocean”, “So Good” and “We Get High”. 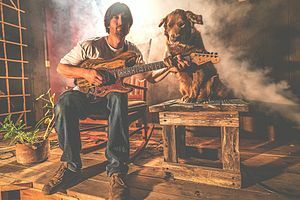 In the summer of 2009, Woodruff moved to the San Diego area and shortly after released his subsequent album, Smoke Stack. This album followed the same recording style of the previous two albums where he individually recorded and layered each track to create a song. Notable songs include “Livin’ It”, “Hawaii Song” and “Vibes Alive”. Smoke Stack was well-received and peaked at No. 8 on the Billboard Reggae Albums chart and No. 17 on the Heatseekers Album Chart. He released The Reprise Sessions on August 3, 2010 under Ruffwood Records. Notable tracks include “Your Way” and “Dead End Street”. On June 12, 2012, two years after releasing Reprise Sessions  Woodruff released the fifth Stick Figure album, Burial Ground. All 14 tracks were written and produced by Woodruff, one of which features vocal by reggae singer Half Pint and one of which features vocals from Woodruff's close friend, T.J. O'Neill. Woodruff cowrote five of the tracks with O'Neill; the two had spent time traveling abroad together in Indonesia, Australia, Fiji, Thailand, and New Zealand starting in 2010, finding mutual inspiration for songwriting. The album reached no. 1 on the iTunes and Billboard Reggae charts, and reached No. 17 on the Heatseekers Albums chart in the United States. Burial Ground met with a positive critical response, with a number of critics noting the mixing of upbeat reggae and dub. According to The Reggae Review, "Original, bass-heavy, one drop beats are consistent throughout the album, as are the subtle nuances...and sometimes not so subtle nuances....of dub. Stick Figure's digits remain firmly on the pulse of roots reggae/dub music." The Pier stated "the album represents a new milestone in Stick Figure's musical growth and innovative abilities, with more layering, instrumental transcendence, and lyrical complexity [than their previous albums]." Stick Figure's original live lineup. After the release of Burial Ground in 2012, Woodruff organized a live band which then went on tour with reggae band The Green starting in September 2012. This tour included eighteen stops along the East Coast of the United States. In Spring 2013 Stick Figure embarked on their first headlining tour with stops in major cities including Boston, Austin, Denver and Chicago with multiple sold-out shows. That year they also went on three national tours alongside reggae bands Passafire, John Brown’s Body, and Tribal Seeds. In 2014, they headlined their first national tour, with numerous sold-out shows including a performance at West Hollywood’s renowned Roxy Theatre that sold out two weeks before the show date. Within two years of forming a live band, Stick Figure toured with other major acts including Rebelution, Slightly Stoopid, Collie Buddz, Passafire, Tribal Seeds and The Expendables. 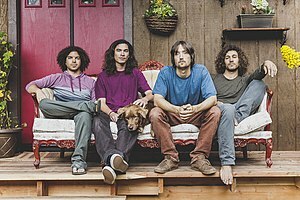 They performed at various internationally recognized festivals including Reggae on the River, Cali Roots Festival, Life is Beautiful, Closer to the Sun, Levitate, and Bonnaroo, amongst others. In 2015, Scott Woodruff relocated from San Diego to a home in the woods in the outskirts of Santa Cruz. Immediately after relocating to his new home, Woodruff built Ruffwood Studios where he recorded the subsequent Stick Figure album, Set in Stone. Woodruff found much inspiration for this album from the redwood forest just outside of his studio. On November 13, 2015, the group released their sixth studio album, Set in Stone. Set In Stone peaked at No.1 on the Billboard Reggae Albums chart, and spent 78 weeks on the chart. It appeared on six Billboard charts overall, including No. 101 on the Billboard 200, No. 24 on Digital Albums, No. 1 on Heatseekers Albums, No. 7 on Independent Albums, and No. 65 on the Top Album Sales chart. Woodruff produced this album in the same way he produced the five previous albums. The 14-track album includes collaborations with Eric Rachmany of Rebelution, Slightly Stoopid, KBong, and Collie Buddz. Following the album’s release, in January 2016 the live band embarked on a US tour with the Southern California reggae band Fortunate Youth. Johnny Cosmic, a multi-instrumentalist, made his debut appearance as a member of the Stick Figure live band on this tour playing keyboards, singing backup vocals and playing guitar. Stick Figure’s song, “Burial Ground” was featured on MLB’s The Show 2016 MVP Edition video game. Stick Figure is collaborating with Mighty Tree in Denver, Colorado to promote Stick Figure Sour, a branded strain of the sativa-dominant Sour Diesel. Stick Figure Sour has also been released in Washington State and Colorado. KBong (keyboards) *Originally from Hawaii, he also had a debut solo album in 2014 titled "Hopes and Dreams". "Scott Woodruff on Making Feel-Good Music". Broward Palm Beach New Times. July 2013. "West Coast Reggae Group Stick Figure Debuts First-Ever Music Video for 'Fire on the Horizon' Track: Exclusive Premiere". Billboard. November 10, 2015. "Stick Figure's Cocoa The Tour Dog". The Pier. March 24, 2015. "LiveMusicDaily Exclusive Interview". livemusicdaily.com. February 10, 2016. "Grateful Web Interview with Stick Figure". GratefulWeb. January 27, 2016. ^ a b Jeffries, David. "Stick Figure Artist Biography". Allmusic. Retrieved 2016-03-14. ^ a b c d e f g h i j "About". Stick Figure Music. Retrieved 2014-02-24. ^ Mlynar, Phillip (May 9, 2016). "Cocoa the Rescue Dog Loves Her Life With Reggae Band Stick Figure". Dogster.com. Retrieved 2016-05-13. ^ a b Krangel, Dana (July 26, 2013). "Stick Figure's Scott Woodruff on Making "Feel-Good Music": Interview". Broward Palm Beach New Times. Retrieved 2014-02-24. ^ a b "Apple Music Preview: Stick Figure 2017". Retrieved 29 August 2017. ^ a b c d "Stick Figure chart history". Billboard. Retrieved 2018-09-06. ^ a b c d e Emodi, Matt (June 11, 2012). "Review: Stick Figure – Burial Ground". The Pier. Retrieved 2014-02-24. ^ a b Matty, Daddy (July 25, 2012). "Stick Figure 'Burial Ground' Review (Stick Figure Music)". The Reggae Review. Retrieved 2014-02-24. ^ Barragan, Juan (August 16, 2013). "Passafire and Stick Figure at the Belly Up Tavern". USD Radio. Retrieved 2014-02-24. ^ "Stick Figure with Pacific Dub and Hirie". LiveNation. October 4, 2014. Retrieved 2016-03-14. ^ Turk, Brian (June 8, 2015). "An Intimate Conversation With Reggae Artist Stick Figure". liveforlivemusic.com. Retrieved 2016-03-14. ^ a b c d e f g h "Stick Figure Discography". iTunes. Retrieved 2016-03-14. ^ a b "Grateful Web Interview with Stick Figure". GratefulWeb. January 27, 2016. Retrieved 2016-05-13. ^ "Top 5 Artists: Best of 2015". The Island Sound. December 31, 2015. Retrieved 2016-03-14. ^ "Home". Stick Figure Sour. Retrieved 2017-11-15. Wikimedia Commons has media related to Stick Figure (band).